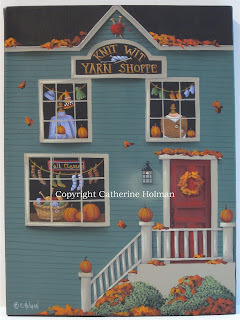 I've had a few requests for a yarn shop painting and here it is! Stella and her sister Delores own the yarn shoppe in the center of town. New friendships have formed with the wonderful customers who sign up for their classes. You could say they are a close knit group. The two sister's spent the day decorating the shop for autumn and whipped up a batch of pumpkin bread to serve in their classes along with a mug of hot spiced cider. For those who don't want the expense of an original painting, it will soon be available as a print which can be personalized. This painting is listed on eBay and you can click on the title above if you are interested. The auction ends tomorrow night. I also have a little cupcake painting that I finished yesterday and listed on eBay. A caramel surprise is tucked in the center of this dark chocolate cupcake with turquoise frosting. This treat is topped with a caramel acorn dipped in melted chocolate and then in chocolate sprinkles. 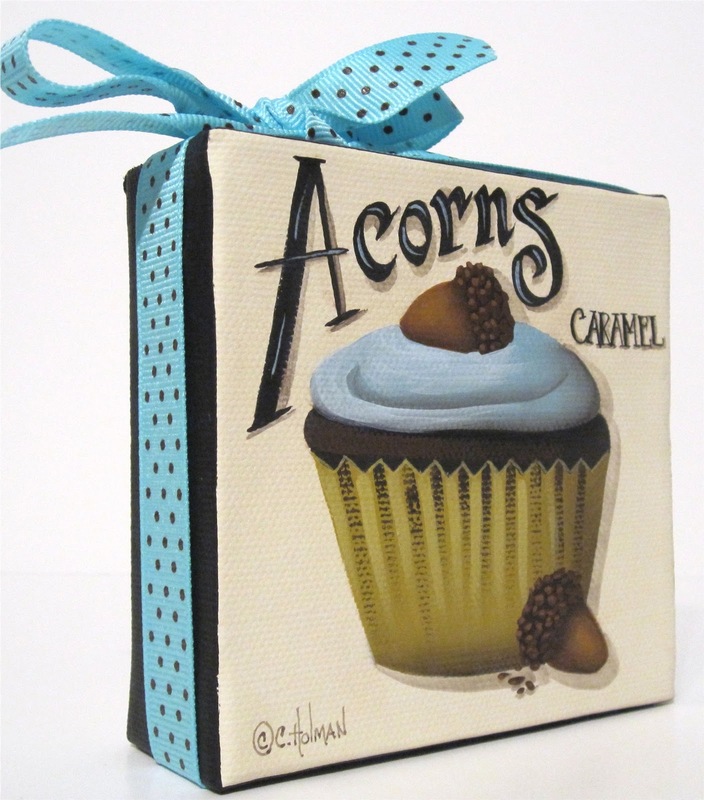 A turquoise and brown dotted ribbon is wrapped around the edges of the canvas and tied in a bow at the top. 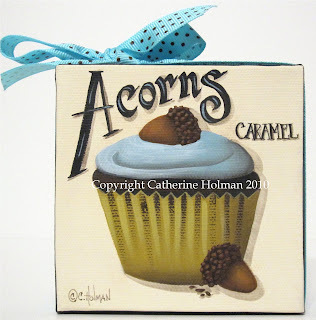 I saw these little acorns on another website and they are simply made with caramels. You place 5 or 6 in the microwave at a time for about 5 seconds. Roll between you hands to shape like an egg. Dip one end into melted chocolate frosting (from a can) and then into chocolate sprinkles. I can't wait to try this perfect treat for Autumn! Cathie, I love this picture!! I can't wait until it comes out in print form. I will order one for my yarn shop owner! Thanks for another wonderful painting!! This is really special Catherine, and the cupcake looks yummy. I love those paintings Cathie! Keeping your FIL in my thoughts. That sounds so cute...the acorns that is. The name of your knitting shop made me laugh out loud! Catherine, your yarn shop painting is amazing....your acorn cupcake is so adorable. Keep up the great work. Hope your FIL is doing better. 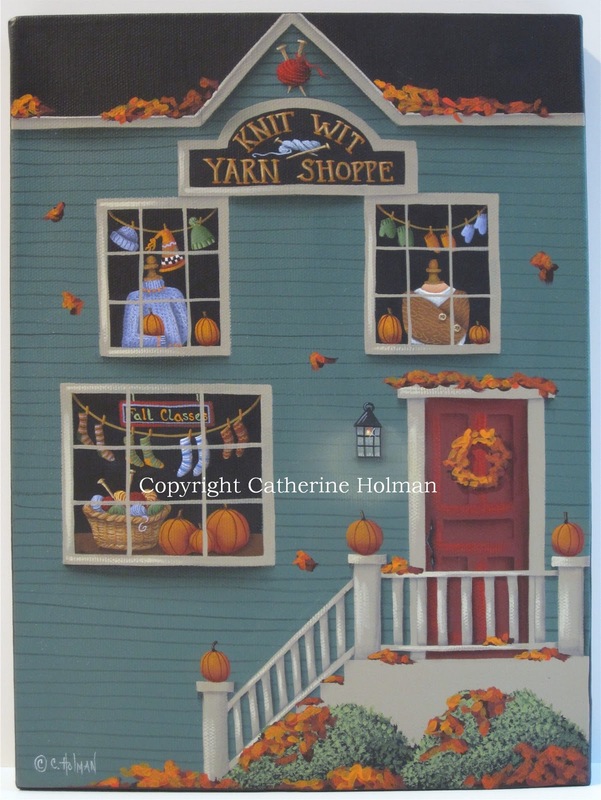 Oh Cathie the yarn shop is adorable!!!!! LOVE it! I have been away for a while but now I enjoy to see the art you all made. 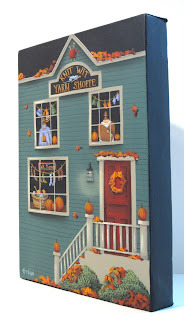 Your -knit- shop painting is soo cool. I really love it. I am looking foreward to see more of your cool art soon. Hi Catherine! I just wanted to let you know that I picked up a copy of Natural Awakenings down here in Arkansas and I love the cover art-Pumpkin Valley. I'm enjoying looking at more of your work here on your blog too! Love the yarn shop! Just might have to try those acorns!